Russia will completely cut Ukraine off gas supplies in two days if Kiev fails to pay for deliveries, which will create transit risks for Europe, Gazprom has said. 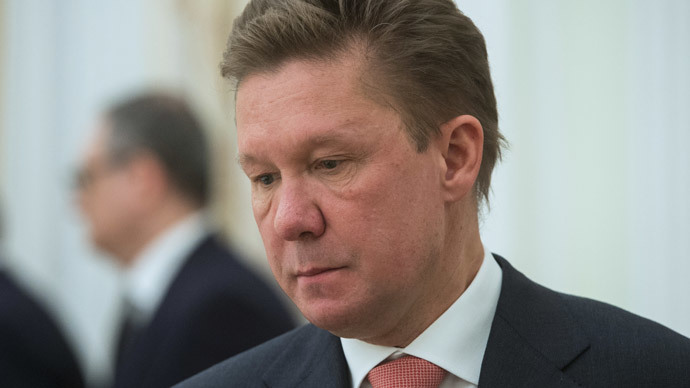 Ukraine has not paid for March deliveries and is extracting all it can from the current paid supply, seriously risking an early termination of the advance settlement and a supply cutoff, Gazprom's CEO Alexey Miller told journalists.The prepaid gas volumes now stand at 219 million cubic meters. Earlier this month, Russian Energy Minister Aleksandr Novak estimated Ukraine's debt to Russian energy giant Gazprom at $2.3 billion. In the end of 2014, Kiev's massive gas debt that stood above $5 billion, forced Moscow to suspend gas deliveries to Ukraine for nearly six months. On December 9, Russia resumed its supplies under the so-called winter package deal, which expires on April 1, 2015. “Europe currently is the main source of gas supplied to Ukraine, that’s why the flawless implementation of our liabilities to transport gas to the EU is our major strategy,” the head of Naftogaz, Andrey Kobolev said. On Monday, Ukrainian state energy company Naftogaz accused Gazprom of failing to deliver gas that Kiev had paid for in advance. Naftogaz says Russia has broken an agreement to deliver 114 million of cubic meters of natural gas to Ukraine by delivering only 47 million cubic meters. During a meeting with President Vladimir Putin on February 20, Russian Prime Minister Dmitry Medvedev expressed concern about an increase in daily applications by Ukraine for the supply of gas, TASS reports. Last week, Medvedev ordered the energy minister and the head of Gazprom to prepare proposals on fuel deliveries to the self-proclaimed Republics of Donetsk and Lugansk (DPR and LPR) after Kiev had cut off the delivery pipeline into the southeastern regions. Ukraine's Naftogaz said it had halted gas supplies to eastern regions due to broken pipelines. Prime Minister Arseny Yatsenyuk said earlier that Ukraine was looking forward to increasing its domestic oil and gas exploration and more supplies from Europe allowing it to completely cut imports of Russian gas.